I have seen several Social Buttons Widget tutorials out there on the interwebz lately. Most are from a Blogger (blogspot) perspective and require html coding. Right after I set up my own social button widget (many months ago), I received an email from a fellow WordPress.com blogger asking how I did it and whether I used html to do it. I responded to her personally right away with some really simple, but un-detailed, directions. First lets take a look at a few simple widget options available for providing readers a way to follow you. These widgets are located in the Appearance menu under Widgets. The most basic widget is the Follow Blog Widget. This is a must widget! It allows users to follow you via email. I believe the default for WordPress.com sites is to have this enabled. If it isn't, you should definitely enable this widget. If you don't know how, here are some directions from WordPress. Follow Blog Widget - this widget gives users the ability to follow your blog via email and is a must have! Allowing users to follow your blog via email is good and all, but what about your social links? You can add the Facebook Like Box widget. It lets you add a like button to your sidebar so users can like your Facebook page. It can also display thumbnails of your Facebook followers and/or your wall feed. To make it so the widget doesn't have a title (like "Connect with me via Facebook") similar to below, simply leave the widget title blank. Facebook Like Box - this widget can be implemented in at least four different ways. Only a like button, like button with follower faces, like button with wall stream, or like button with faces and wall stream. Another social widget is the Twitter Widget and the Twitter Timeline Widget. The Twitter Widget displays your tweets and offers users a button to follow you via twitter. It offers some filters, like not showing tweets from the publicize WordPress feature, filtering replies, or filtering retweets. The Twitter Timeline Widget is a little different, as it is the official Twitter Widget and offers interactions, like retweets, replies and favoriting tweets. You will need to set up this widget on Twitter first, and then it will be embedded into your sidebar. It can also be embedded in a post or page! Twitter Widget - Includes your feed plus a follow button. While writing this post, I discovered the About.me Widget and the Gravatar Profile Widget. It looks like the About.me Widget provides a really beautiful looking profile page (outside of your blog). The profile page includes a custom background, a bio and then all of your personal links and social networking sites. The widget provides a miniature profile including the picture of you, your bio, a link to your profile page and your social links. I actually excluded my bio because it was too long. You do not have the option to provide a smaller blurb. The social apps included Facebook pages, but every time I tried to add my Facebook page it kept grabbing my personal Facebook profile (I'm using Chromebook, so maybe it will work more nicely with other OS/Browsers). There did not appear to be a Google+ page and no Pinterest or Boglovin'. You can add custom links, like to your Pinterest page, but they will not show up on the widget. The About.me profile is very cool. You can check my profile out and see what you think. You can move your bio anywhere on the screen. The background image (mine below is the default) can be dragged anywhere too. You can customize colors, fonts and font sizes. It is an interesting concept, to have a hub that then links to all of your social sites. 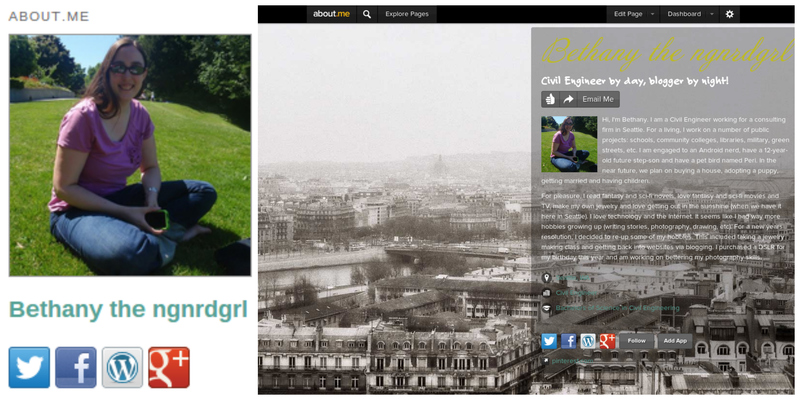 About.Me - Widget on the left, my About.me profile on the right. I already use the Gravatar widget to provide a picture of me and a little about me blurb. The Gravatar profile picture is also used as my profile picture when I comment on WordPress blogs. The Gravatar Profile Widget must be new. It provides a miniature Gravatar Profile, including a blurb about you, your picture and your social links and/or links to your websites. What I don't like about this widget is that it auto grabs your social links when you sign in with each service. Guess what? It grabbed all of my personal social sites, not my pages. It also didn't have Pinterest or Bloglovin'. Gravatar Profile Widget - includes your profile picture, your bio, personal links and social sites. The social sites are auto grabbed and ended up being my personal sites, not my blog's pages. These are good widgets, but what I really wanted was a social site widget that includes all of my social sites in one widget, including Pinterest, Bloglovin' and any other social service I decide to sign up with. The user that had emailed me had come up with decent solution. She added all of her social sites as an Image Widgets. 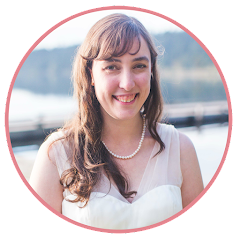 Each social site has its own logo, so she would add them individually as an image widget and set up the link to go to her page. She had titles to each one, so I would suggest removing the titles and seeing how that looks. One last idea would be to set up the Links Widget with all of your links. 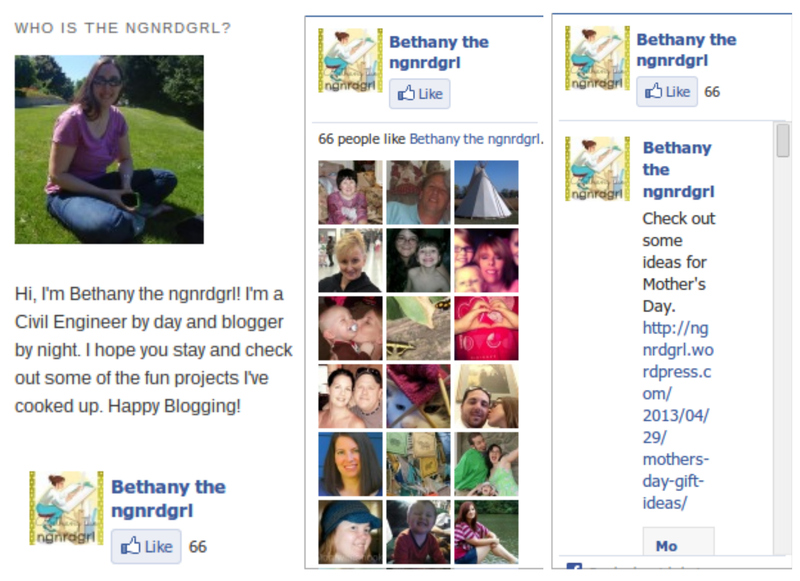 This would be set up the same way as a blogroll, but with your social links instead of blogs. The links will show up as text links or image links. When making a demonstration widget, I was actually surprised how well this option turned out. The only problem with the image links is that this is a vertical widget and doesn't list them horizontally. It also includes bullets by each link. Link Widget - Left is the widget with strictly text only links underneath my about me blurb. The middle image is a image link only, while on the right is image and text links. This widget turned out surprisingly well. What I really wanted was custom buttons that matched my theme and are horizontal in order to conserve real estate in my sidebar. So what is a girl to do? Well, I did what any DIYer does. I engineered my own widget from scratch! In Part 2, I will step you through how I made my custom social buttons widget. Disclaimer: The background image for the banner is courtesy of Shopseal and licensed under the Creative Commons Attribution license. All other images are my own. Okay, I really need to set aside some time to really read and follow your tutorials. (Same goes for those found on Lauren's "The Thinking Closet".) I've surprised myself in that I actually figured some of these out on my own - the easy ones. Thanks for sharing your wealth of techie knowledge! Haha! You are welcome. I just went exploring in the widgets section to figure these out. Next week I'm going to show off how I made my social buttons widget from scratch. Yes, you are officially the smartest person I know. :) You are my hero for doing great things without html! I'm seriously so impressed. Looking forward to part two! Haha! You totally are that "fellow WordPress.com blogger," but not any more! Your blog totally rocks now! :) I kept that email chain and kept thinking to myself that I really needed to do a write up on it, so I am finally getting to it. And no worries on the delay in commenting. I am so backed up on reading everyone's posts! I think I owe you like a couples weeks worth of reading!!! (or at least a couple weeks of commenting. I read some of your posts on the bus on my phone, but couldn't bear the idea of typing out a long winded comment on my phone.) Hugs! And don't worry about playing "catch-up" with comments; I know how crazy life can get...and I, too, read my bloglovin' feed when I'm out and about, but don't dare try to hunt-and-peck my way through typing a comment. I've gotten burned too many times with typos and failures to post because I'm not logged in or something. Hugs back! I am impressed to Visit your post Thats nice entry.I want to follow your blog post continue. You can see also this post. How generous of you. Pinning.